Please click here if you want to submit a race. 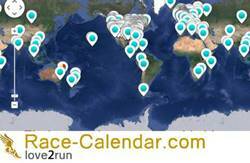 ***PLEASE NOTE: Race-Calendar.com does not currently host or organise any races. If you have specific enquiries about sponsorship money, race numbers or routes etc, please go to the race listing, click on the “Entry” tab and look for “Entry Contact / Race Secretary.” Alternatively, click on the “Info / Description” tab, look for “Race Website” and click on the golden “Click here” to visit the race website.